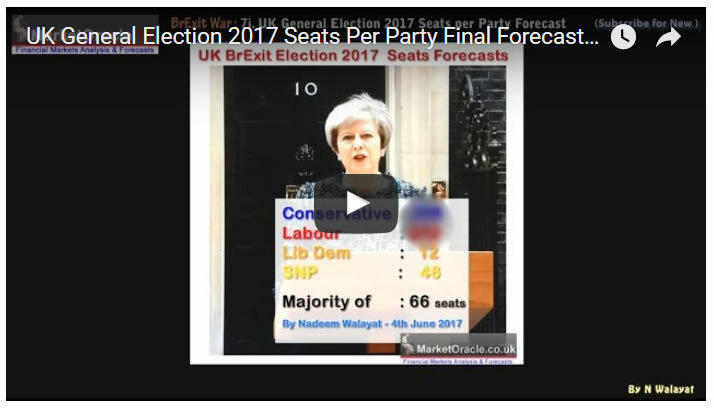 UK General Election 2017 Spread Betting Arbitrage to Lock in Risk Less Profits! With the opinion polls all over the as illustrated by the pollster based Conservative Party seats forecasts wide range from 304 (YouGov) to 380 . The spread betting markets are throwing up a disparate range of possibilities to arbitrage between the different quotes across a range of spread bet market makers. So on the basis of my forecast conclusion and with 2 full days to go until the polls close my search has been on for spread and exchange betting market opportunities where the focus of this article will be one of locking in arbitrage opportunities i.e. profit without risk as one is both buying and selling the same market and pocketing the difference between spread betting market makers, after allowing for the bid / offer spreads! FIRSTLY, understand that gambling is a high HIGH RISK activity and losses can exceed deposits. So if you don't have the stomach to take a loss then DO NOT TRADE OR BET! As my primary UK election forecast expectation is for the Tories to win the election on 358 seats, a 66 seat majority. However, there are also risk less profit opportunities when comparing prices across spread betting market makers, for instance here are the current quotes from three spread betters at the same time. 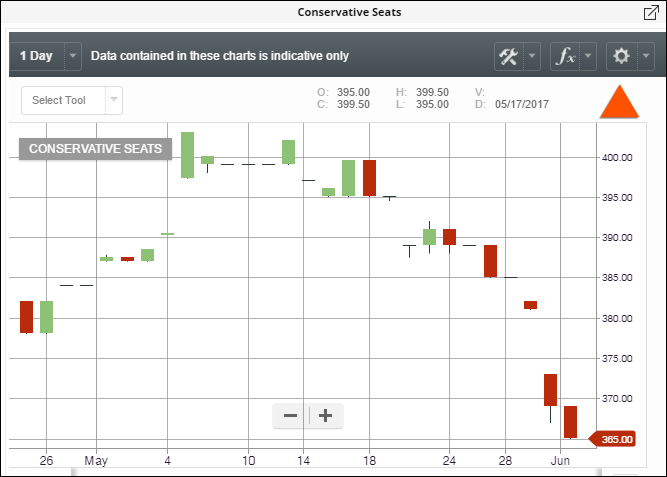 So here the arbitrage could be to BUY IG Conservative seats at 361 and SELL Financial Spreads at 365 for a risk free locked in profit of 4 points per amount bet. i.e. £100 per seat would convert into a risk less arbitrage locked in profit of £400! No matter what the result of the election turns out to be! Or BUY Labour at 203.5 Financial Spreads and SHORT Labour at 208 IG thus locking in 4.5 points. Thus profiting by locking in profits from the difference in the price of seats quoted between spread bet market makers. And is usually the case for such events such as elections is to expect increased market price volatility that is likely to result in many short-term arbitrage opportunities as we countdown to the election result! Therefore I expect volatility in the wake of for instance YouGov's crazy polls to deliver market opportunities both in the countdown and in the immediate aftermath of the UK General election result, just as occurred during the US Presidential Election and the EU Referendum. So it could be worth keeping a very close eye on the spread betters for significant deviations both from my forecast and form one another's prices for arbitrage opportunities. Again do remember that betting is high risk and losses can exceed deposits, so if you cannot stomach a loss then DON'T BET!